A text giving service is a great tool to have at your event, for so many reasons. It’s simply an easier and more secure option, for the donors and the organization. Does your organization currently rely on forms, requesting personal or payment information? With identity theft on the rise, organizations can provide a more secure way for their attendees and donors to give this information, while protecting their sensitive personal and credit card information. Txt2Give can collect any registered donor’s information, allow them to purchase tickets or donate, send receipts, and provide you with the exportable information, all simultaneously. Think how much time, money, administrative work you’ll save! No more of having to manually sort through and enter the massive amounts of information, prepare deposits and drive to the bank. With a mobile giving service, such as Txt2Give, all of that is automatically done for you, freeing up your time (or your volunteers’ time) for something else. Communicate how to use the service. Since our entire process takes under a minute, it’s a great idea to have your host of the event run through a quick donation, just to demonstrate how quick and easy it is to do. You’ll ideally want to aim for a time when you have everyone’s attention. Continuously promote your organization or events on any material you may hand out or mail out – all year long. It’s as simple as including the QR code or phone number on your promotional materials that are distributed throughout the year. Since our service allows you to have multiple causes, it doesn’t have to be for just one specific event either. Place the QR code and phone number numerous places at the event (seated tables / t-shirts / bags / cups / stickers, etc). Advertise your donation information along with brief instructions on how to use the service. It provides an easy way for them to donate without having to remember verbal instructions. 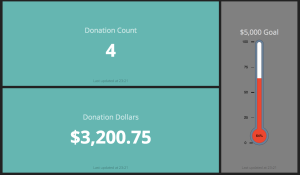 A great way to get people involved at the event is to let them know just what their donations do to help your organization. Give them stats, photos, stories, etc (ex. “last year, because of your generosity, we were able to buy shoes for 250 kids”). 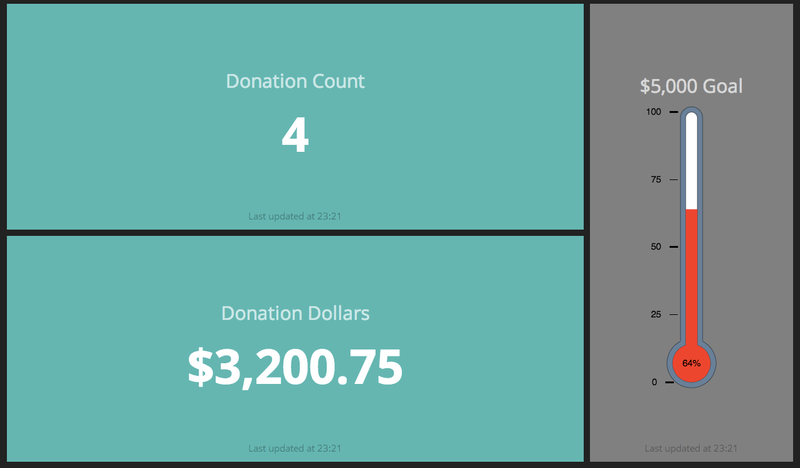 You can also use tools such as real-time dashboards, shown below, to help donors visualize how close they are to your goal. We can customize the dashboard to fit your event, too. Mobile Giving — Is it Good for Your Organization?